25/1/13 - Acquisitions - Saint-Omer, Musée de l’Hôtel Sandelin - Born in 1825, François Chifflart, a student of Léon Cogniet, was awarded the Prix de Rome in 1851 for Pericles at his Son’s Death Bed. He belongs to the group of artists described as late Romantics, fond of dynamic compositions and fantastic subjects. His strong personality and his refusal to compromise his ideas made for a difficult career as a painter explaining why he turned to etchings, making it his specialty, as well as illustrations for the works of Victor Hugo, a close friend, with wood engravings. In 1993, he was highlighted in a small exhibition (and a catalogue) at the Musée d’Orsay (François Chiffart graveur et illustrateur). The Musée Sandelin in Saint-Omer, the artist’s home town, already owned eleven paintings by Chifflart as well as some drawings and engravings. It recently acquired an ensemble of six charcoal drawings and one gouache enabling the museum to round out its holdings which will soon be featured in a special study exhibition. The goauche (in fact, a gouache drawing) represents Hercules Seated, leaning on his club (ill. 1). The museum has dated the work as being from around 1865. There is at least one other known drawing by the artist representing the demi-god, fighting the Nemean lion, held at the Musée départemental de l’Oise. 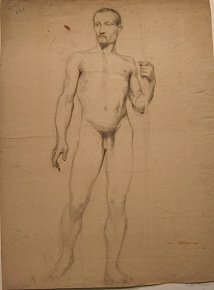 Two other drawings are male academic nudes (ill. 2 and 3) which are rather conventional and date from Chifflart’s formative years at the Ecole des Beaux-Arts. In fact, the first one is signed, on the back, both by the artist and by his master Léon Cogniet. Two sheets represent figures which are probably preparatory for painted or engraved compositions (out of about two hundred engravings quoted by Léonce Viltart in 1897, there are only about one hundred which are known ), or else illustrations. One has been identified by the museum as being Two Young Roman Women Conversing (ill. 4) and slightly recalls both in subject and style, Thomas Couture, while the other figure is an allegory, perhaps Justice (ill. 5). Finally, the ensemble purchased by the Musée de Saint-Omer also includes two landscape drawings (ill. 6 and 7) where, here again, the technique calls to mind that of Thomas Couture. In concluding this news item on François Chifflart, we cannot resist the temptation of showing one of his masterpieces, a preparatory drawing for an illustration of La Légende des Siècles, a wood engraving executed by Joliet, residing at the Maison de Victor Hugo (ill. 8). Catalogue from the exhibition, François Chifflart graveur et illustrateur, p. 18.